Chuckling Goat grabbed my attention for several reasons. Firstly the name – what is there not to love? 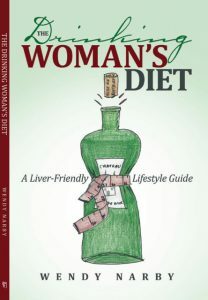 More seriously, when I was researching ‘The Drinking Woman’s Diet’, the importance of the gut microbiome came up again and again, mainly due to the role that alcohol can have in harming it, and the importance of topping it up or keeping it healthy if we are to continuing enjoying a drink and remaining healthy. The other reason chuckling Goat seduced me is the link to my alma mater, Aberystwyth University. The laboratory testing of Chuckling Goat kefir takes place at the Institute of Biological, Environmental and Rural Sciences at Aberystwyth University. There’s a theme here, see the previous post. 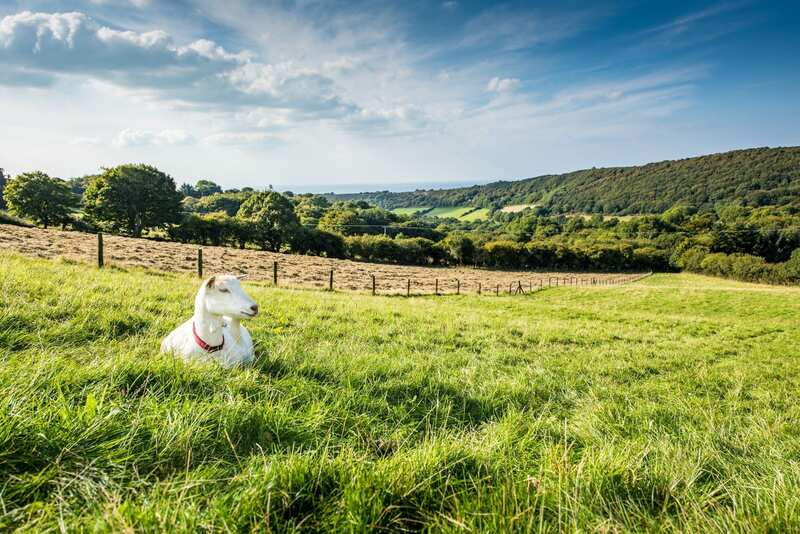 Falling in love with a Welsh farmer in her forties, Shann Nix Jones left her job in San Francisco to run a 25-acre self-sustaining farm in Wales with her husband Richard. In 2009 they bought their first goat to help with their son’s eczema and asthma. Goats’ milk is often recommended for eczema suffers, many of us have intolerance to cows milk and sheep or goats milk can be easier to digest. Shann and Richard took this a step further, making kefir from the surplus milk. When Richard developed an antibiotic-resistant MRSA infection, Shann found that using a combination of essential oils and their own homemade kefir helped support his recovery. I loved it when my first delivery arrived. I’m easily influenced by good packaging, and this was good, practical but with a sense of humour. The idea of these bottles winging their way from Aberystwyth to me in Bordeaux was very exciting. 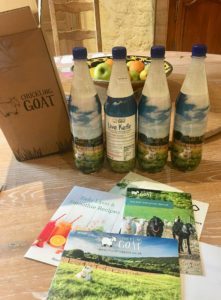 To learn more about the Jones’ adventure, read ‘Secrets of Chuckling Goat’ where Shann tells her story from California city girl to Welsh farmer and how developing her kefir helped save her husband’s life and cure her son’s health issues. Her second book, ‘The Kefir Solution’ covers more in-depth scientific research about the microbiome, including the gut-skin connection to eczema, psoriasis, rosacea and acne, illnesses that are often accompanied by hay fever, asthma, IBS and food allergies. She remains convinced that her kefir-based Good Skin Solution can help to treat both the symptoms and the underlying causes of many skin conditions. 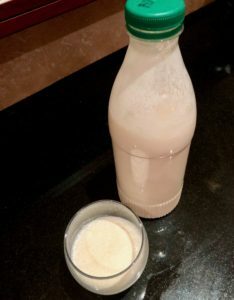 You can make your own kefir. After a recent breakfast with Liz Earle at 67 Pall Mall I was inspired to do just that. I used cows milk, but I don’t think it tasted as good as this. Drinking on an empty stomach is not a good idea, so if I think there might be booze and no food where I’m headed, I’ll drink a small glass before going out . Why not coat the stomach with something that will not only slow down the absorption of alcohol but also kick start some healthy bugs? My home brew kefir, not quite as attractive or tasty. A healthy digestive tract works to eliminate toxins rather than produce more, taking some of the pressure off the liver. Alcohol can be just as much of an enemy to our gut flora as stress, lack of sleep, a poor diet or even antibiotics. Have you ever had an upset tummy after a heavy night? Alcohol can lead to disruptions in our gut micro biome and increased intestinal permeability (leaky gut). Alcohol can multiply the number of gas-producing bacteria by a factor of up to 1,000. You have been warned! This microbiome deserves to be treated with as much tender loving care as our livers. Not only does it help digest the food we eat, reduce bloating and neutralise toxins, but also it also produces vitamins, and even help raise our mood. Although the list of micro bacteria in the Chuckling Goat kefir is impressive, the key to a happy, healthy gut biome is to cultivate a variety of bacteria, so you might want to mix it up with other sources of friendly gut bacteria to maintain balance. Where do these bugs come from? They come from our mothers’ birth canal, through breast-feeding and through our diet, including fermented foods such as yoghurt, kefir, sauerkraut, raw cheese, kimchi, miso and apple cider vinegar in your diet will help replenish this population. So can wine help too? It’s fermented after all. 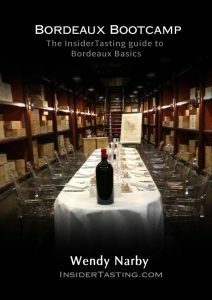 Some research suggests that red wine in particular may help by adding bacteria of it’s own. Lactic bacteria are used in mainly red, but also some white (often Chardonnay) wines to transform malic acid into lactic acid. Red wine might also feed existing bacteria with polyphenols such as resveratrol. But, as ever, moderation in all things as too much alcohol will wipe out all the good work. Living in too sterile an environment may also be hindering the proliferation of healthy gut bacteria. There may be some truth to the old wives’ tale—you have to eat a little dirt before you die. Pro and prebiotic supplements can also help but get some advice as not all contain active bacteria and they can contain different concentrations and different strains. There is some question as to whether taking them orally is efficient as they may not survive through the digestive system. You might just end up with very expensive poo! Once established, you must keep your bugs happy by feeding them what they love. They really don’t like too much alcohol (apart from an occasional glass of good red wine, see above), junk food and the artificial sweeteners, emulsifiers and preservatives found in them. They don’t enjoy emotional stress and can be destroyed by antibiotics. Guess what they do love? Vegetables, and the really fibrous ones: asparagus, artichokes, garlic, onions, leeks and chicory root are favourites, as are root vegetables such as beetroots, carrots, rutabaga (swede), and parsnips. These prebiotics all contain a soluble fibre, inulin, which feeds the good bacteria. 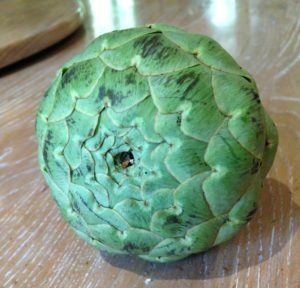 Artichoke, a liver tonic and microbiome food. Try to include the fibrous stalks of vegetables in soups, as they will remain undigested until they reach the colon offering a feast for your bugs. They also quite like green tea, dark chocolate, a little red wine, extra virgin olive oil, dark black cherries, blueberries and raspberries for the polyphenols. So a balanced diet for both you, and your bugs. Bon appétit!